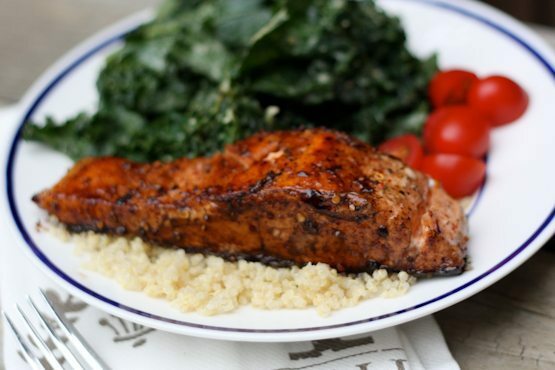 This clean eating balsamic salmon recipe will become your go-to salmon recipe. It’s so easy and takes less than 20 minutes to prepare. 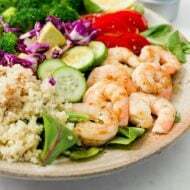 Despite the fact that I love seafood, I don’t have many seafood recipes posted on here on EBF. I’ve decided it’s time for that to change! To kick things off I’m sharing a delicious and healthy balsamic salmon recipe today. The best part about having fish for dinner is that it cooks super fast and you can have dinner ready in less than 30 minutes. <– Always a plus in my book! Heat oil in a large skillet over medium to high heat. Season both sides of salmon with salt and pepper. Add salmon to skillet and cook 1 to 2 minutes per side, until golden brown. While the salmon is cooking, whisk together honey, vinegar and red pepper flakes in a small bowl. Add vinegar mixture to skillet and simmer until fish is fork-tender and liquid reduces and thickens, about 5 minutes. For a thicker, reduced sauce, simmer for 5 to 10 additional minutes. Just make sure you don’t overcook the salmon. I served it up on a bed of quinoa with a side of tomatoes and garlicky kale. 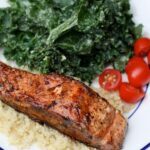 Not only is this salmon easy to make and healthy, but it’s super flavorful, especially considering there’s only six ingredients involved, all of which you probably have in your kitchen right now. It doesn’t get much better than that!! If you try this balsamic salmon recipe please leave a comment and star rating below. 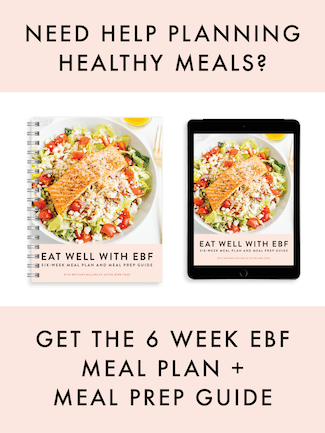 Your feedback makes my day and helps other EBF readers who plan to make the recipe. I love the sweet/tangy combination of balsamic and honey. Looks amazing! Congrats on your April Challenge success! Hard work pays off!!! You’re right, Brittany, I do have all of those ingredients in my kitchen right now, and we eat salmon every week. I’m going to try this on Thursday! Yum! I love finding new salmon recipes. Thanks for sharing! I’m so glad you are doing well with your challenge from April! Keep up the good work! Oh, salmon! 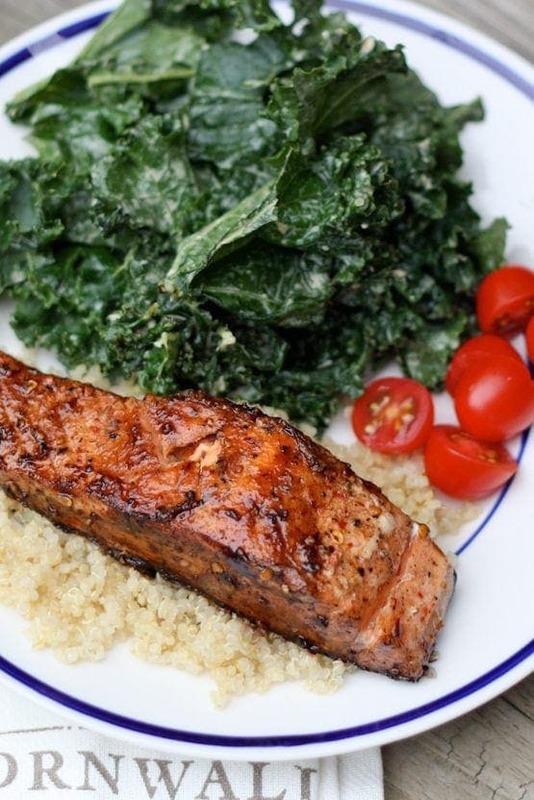 I love salmon and this recipe looks deliciously healthy. Gotta try this out. Thanks for sharing. I am totally going to make this for dinner tomorrow! Thank you so much for sharing!!! 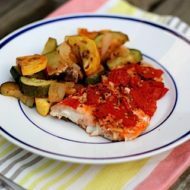 Thanks for this- I love a good and fast fish recipe. Made the salmon tonight for dinner – it was delicious!!! Thanks! This shockingly simple recipe is great! I have to remind myself sometimes when I cook that simply using 2-3 ingredients is okay and can taste REALLY good. This recipe is definitely in my cooking rotation now—fast and delicious. I am cooking this right now, but the problem I am having is that 3 1/3 tablespoons of liquid is not enough to simmer anything — it just disappeared in my pan when I poured it in. Smells great but just hope the fish is done because there isn’t enough liquid to keep cooking it. Great recipe! My family loved it. Thanks! So happy to hear that Jacinda. Thanks for coming back to comment and let me know. So glad that you both loved it. Thanks for coming back to let me know how it turned out. Do you take the skin off? Delicious!! I added sriracha to taste and grilled it on a cedar plank instead of a skillet. I just brushed the sauce on as it cooked. Definitely making this again! So glad you liked the salmon, Diana. I’m so glad you like it, Candice! Yay!!! So glad you and your SO enjoyed this one!! A mommy of 3 little ones and whose husband is gone A lot for work, trying to make a quick easy healthy meal that isn’t a smoothie is tough sometimes! 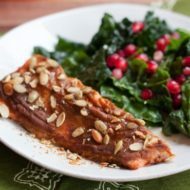 I love salmon and I am totally making this, like right now!! Thank You! ???? Yay!! I hope you loved the recipe, Nina! This was my first time cooking salmon and this couldn’t have been any easier or any more delicious! I loved it! Quick and easy utilizing pantry staples that are readily available! I seared the fish then used the balsamic glaze as a basting liquid for 3 min and tossed the filet into a 350 deg oven for 4 min with my asparagus/roasted garlic combo. Served with mushroom couscous and this was my favorite meal all week! Thanks for sharing!! Great recipe!Switched the plain balsamic vinegar with a HONEY infused balsamic vinegar. tasted great, though mine dried out a bit.